To ensure our customers get the very best in PV products and services, we take great care in selecting our partners for the necessary complementary technologies. Recently, two of our partners, Dhybrid and Ilumen, won nominations to the finals of the prestigious Intersolar AWARD, an annual exhibition dedicated to celebrating innovation in the international solar industry. 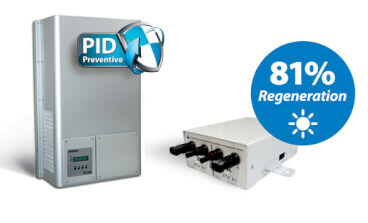 Ilumen is a finalist in the photovoltaic category and is the company that designs and produces the PID Box Mini (tcm:40-63178): the device that is able to regenerate in-the-field PV modules affected by PID (Potential Induced Degradation). PID is the main threat to financial revenues in the photovoltaic sector, where power loss can reach 60% of nominal power. Dhybrid Power Systems is nominated in the category of “Outstanding Solar Projects”, and is the company that developed the market-leader solution for hybrid photovoltaic/diesel systems. When connected with the serial interface of our KP100L Inverter (tcm:40-30673), the Fuel Reduction System from Dhybrid is able to manage the need-based photovoltaic feed-in depending on load and generation-profile. The technological base for compatibility was developed by our own R&D department when it designed technological compliance with European Grid Requirements (VDE AR-N 4105- Technical Minimal Requirement for the connection to German low voltage distribution Network, and CEI 0-21 e CEI 0-16, technical requirement for the Italian Grid). These nominations come at a time when the photovoltaic sector is expanding its geographic boundaries and adapting its business model country by country. Top priority in Europe is revamping, whereas in emerging countries main focus are Mini Grid Applications, where combining local diesel generators with PV plant can satisfy power needs in rural areas, which are too isolated for the mains power grid.